Its that time of year again! 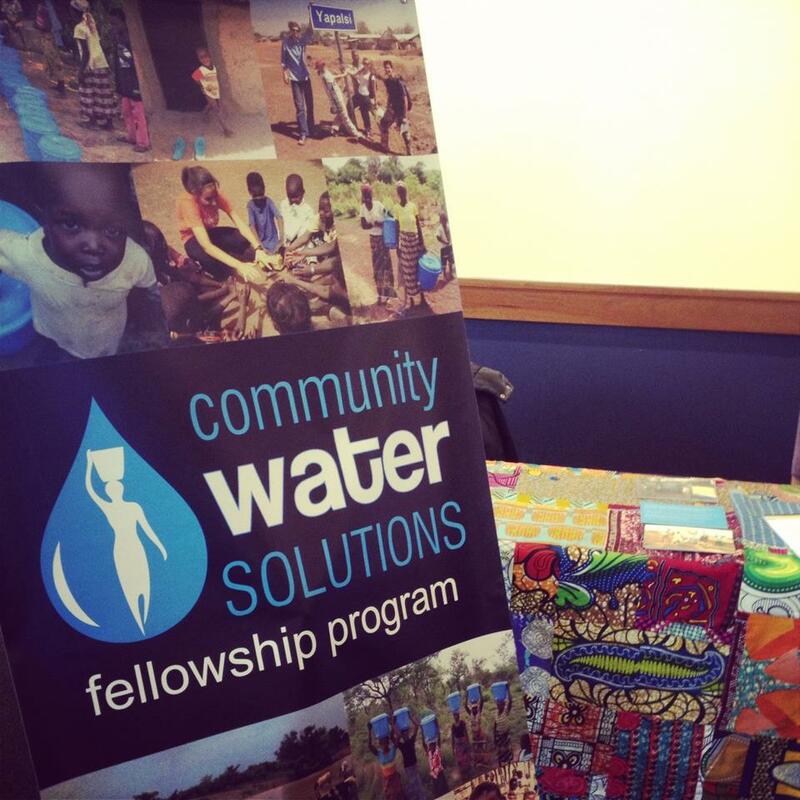 CWS is hitting the road to recruit for our Summer Fellowship Program (apps due March 15th, APPLY HERE!) This year, we’re doing things a little bit differently, focusing on career/internship fairs instead of info sessions. Check out our schedule below and if you’re in the area, come on by our booth and chat with us! Don’t see your school listed an want to learn? 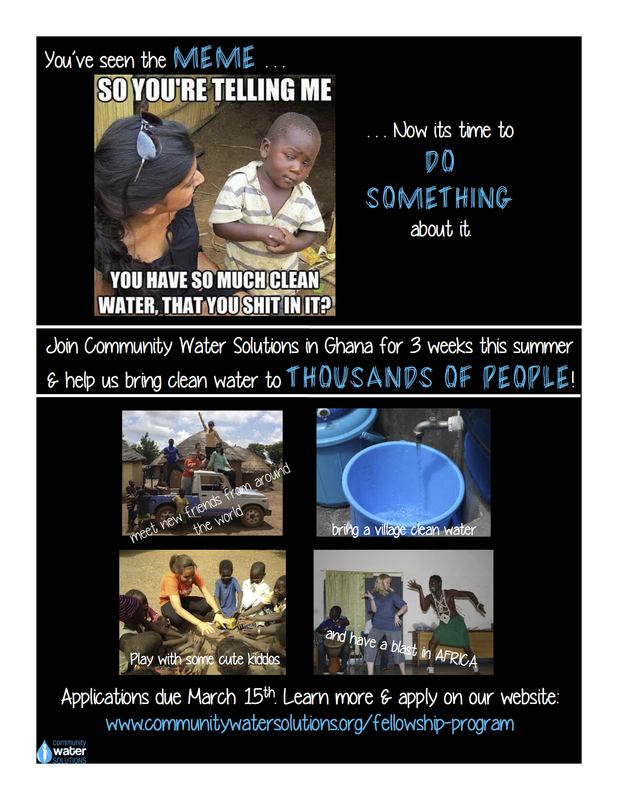 Email Sam (sreilley@Communitywatersolutions.org) and we’ll try to schedule info session for you! Team G here (Gabi, Katie, Jane & Jakob). Today we went to our village, Kulaa, to conduct monitoring of the villager’s safe storage containers. Jakob stayed home with an injured foot (who is now fully recovered) but we had Sam with us, which really helped to get us through an otherwise very hot day in the village. We started our day on Ghana time (aka slightly later), but we stopped along the way to pick up egg sandwiches, which are heavenly, they consist of scrambled eggs, tomatoes, onions, and Panini bread, all for the price of 1 cedi and 50 pesewas (75 cents) for a two-egg sandwich. Once in the village we intended to conduct safe drinking water discussions with the children at the school, but everyone was still cleaning the school building since it was the first day back after the holiday break. Instead, we coordinated with the teachers to conduct the safe water discussion tomorrow, and we went household-to-household for monitoring for the rest of the afternoon. We were very pleased with our monitoring as all of the households had clear water, and everyone exclaimed how they loved the taste of the clean water and would continue to drink the clean water from the polytank. We all love our village, and the villagers in particular are extremely warm, welcoming, and helpful with everything we bring to them. Tomorrow will be our last day in the village and we plan to shower them with candy, clothes, water bottles, and toys. We will greatly miss our village and everyone in it, but we are confident they will maintain this water business for years and years of good health. Team C, aka Charlie’s Angels (consisting of Emily, Lauren, Sarah, and Priya), ventured into the school in Tindan today to teach students about healthy drinking habits! First, Sarah, Emily and Lucy (our photographer) went to the dugout and water treatment centre to collect materials for the games, and check on the women (Adamu and Maymuna).After a couple days of distribution and monitoring safe storage containers, the kids of the village were excited about learning healthy drinking habits! The motto of our first activity was: clear does not always mean clean! 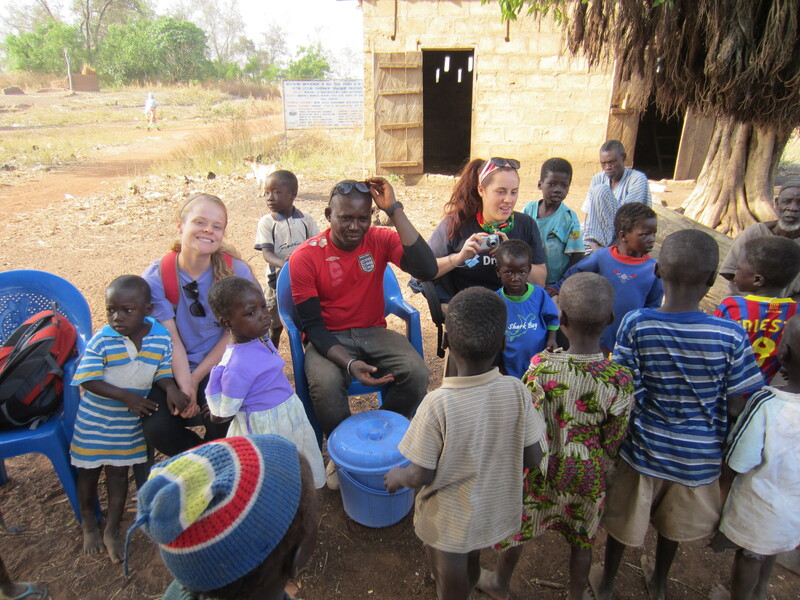 We had the kids gather around while Emily and Priya presented them with three water bottles, filled with polytank water, a salt-water solution, and dugout water. We asked them which one(s) they would like to drink, and the two clear solutions were chosen. Needless to say, Abrahim, a little boy of the village, was shocked that the salt water solution tasted bad even though it looked clean. The kids laughed, and we taught them that re-contamination is not always visible, so they should keep their hands out of the safe storage containers. Next, we played ‘healthy-habits tag’, where we taught the kids safe drinking habits. Three kids were “diseases”, who were “it” in the tag game and, five kids were assigned healthy habits, giving them extra lives in the game. 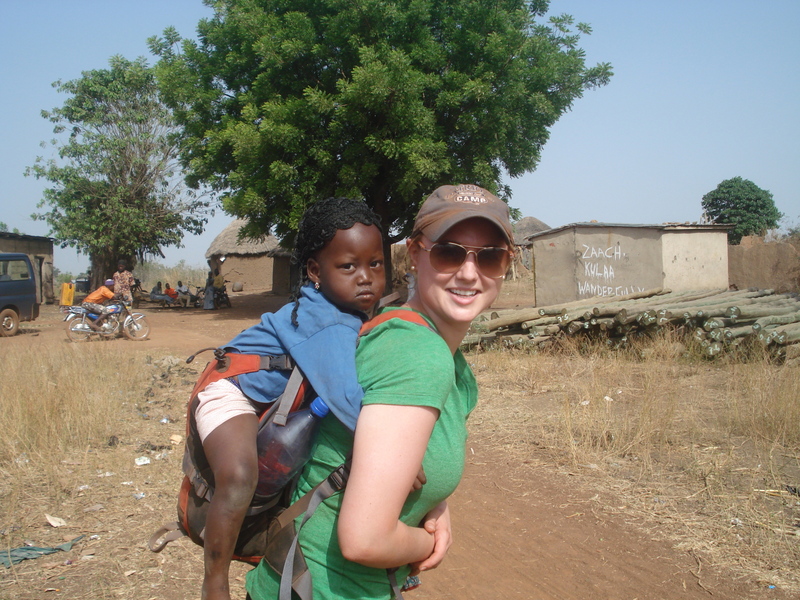 Lauren volunteered as a “disease,” and the young Tindan kids outran her as we all played. At the end, the kids with the healthy habits cards (drawn by Priya!) remained standing which showed how crucial healthy drinking habits are. Playing games while educating was a great way to introduce healthy drinking habits to the kids and excite them about their safe storage containers filled with clean water! We are sad to leave Tindan, but we have left the centre in the capable hands of Adamu and Maymuna, and we are confident that the children will practice safe drinking habits! Summer Fellowship Applications Now OPEN! Applications for the Summer Fellowship Program are open! Click here to apply now! 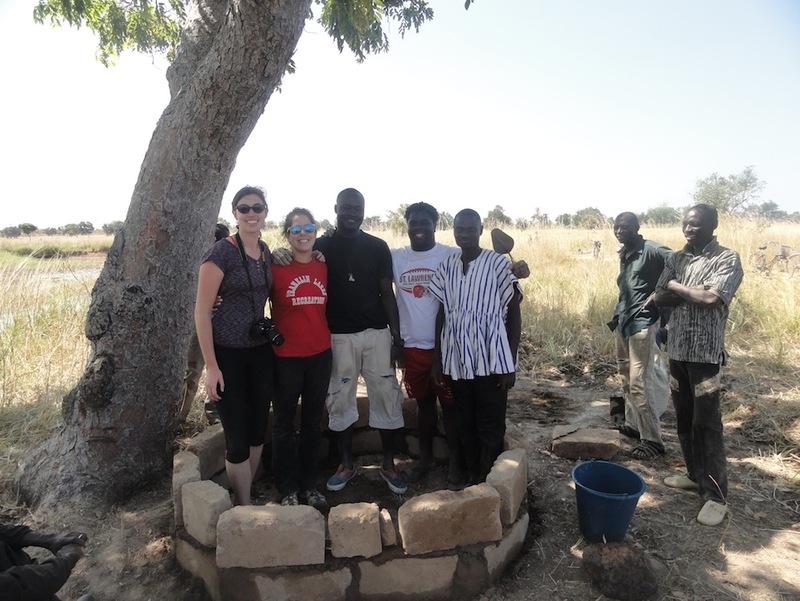 Team E (Linda, Vanessa, Alexa, and Julia) has spent the past week in Nekpegu, a small village of 26 households. Prior to opening day, we had met with the chief and whole community and distributed 26 buckets to all the households. After only an hour on opening day, all buckets had been filled at the center. Our two women, Fatima and Ramatu, had made a profit of over two cedis—which is more than a weekly income for most people in rural Ghana. What was best for us was really watching the women take charge, and see the village’s excitement. When the chief arrived at the polytank Ramatu was so eager to have him take the first drink from the tap. (The photo of him smiling is when he was asked what it tasted like… I thought it tasted pretty good, too.) The second they turned the knob and saw the crisp clean water, the whole line of 15 women and children started clapping. During the first training session we had with Ramatu and Fatima, which Julia helped lead, Ramatu modestly accepted Julia’s notebook and pen and explained with a smile that she could not write. Seeing her pose with her notebook and pen, after learning how to tally the people who arrived, gave light to the empowerment that the CWS model brings to the women of these villages. 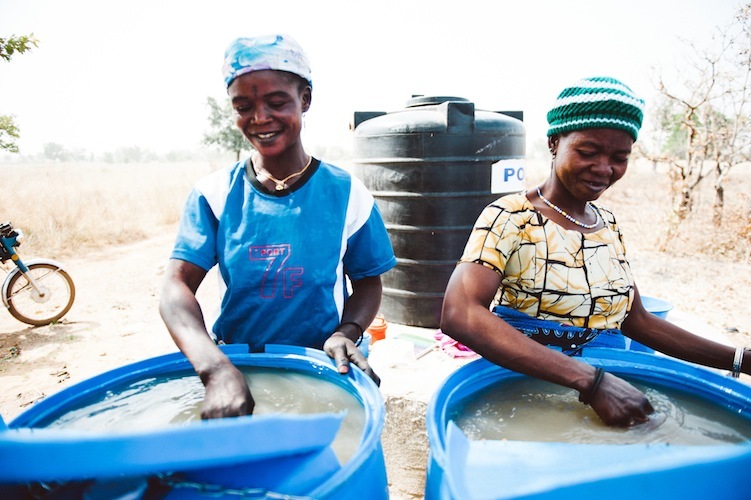 The next day, the polytank was empty and our women were enthusiastic to start round two and scoop their blue drums into the tank for treatment. On our last days we get to monitor and hear back from our households on how the center is working for them (and mostly just how the water tastes.) We will also be spending a day at the small school in our village and we are excited to get to help start the education process with our children—because, as our chief said to us, the kids will help enlighten them. Welcome to Kalinka! A beautiful village tucked in the northern region of Ghana, home to over 300 people. Our team is small: Casey, Ty, and me. Our goal is big, to implement safe, clean, and healthy water for Kalinka. Our process is simple but layered. Here we present a day in our journey, we hope you enjoy! It all began at sunset. We awoke bright and early to begin our hour and a half drive to Kalinka, situated beyond the lull of the city, beyond a maze of potholes and dusty roads. As we waited for out trusty translator to come pick us up, we realized we were on American time and our translator T.J, was on Ghanaian time. Nonetheless, T.J arrived with our taxi, we all piled in the backseat, squashed together like a pair of sardines, a prerequisite of such closeness is you get to know your teammates very well. As we were discussing exciting anecdotes of our past and hopes and aspirations for our future, we were pulled over by the police. We handled it like pros, that is to say we kept our mouths shut and allowed the experts, our translator and driver, to handle the situation. After what seemed like hours, T.J informed us that our driver’s license had been seized by the police, much to his and our disappointment. Despite the inconvenience we marched on, we arrived at Kalinka behind our scheduled time, but on village time. Once there, we finished day two of our training. Casey took lead, instructing the women on how to scoop the clear water into the polytank prior to chlorination. T.J and Ty excelled at handling the large polytank and making sure it was in top operating condition. I distracted the little ones with my camera and generally took pictures of everyone in awkward situations. One exciting moment was when Casey successfully balanced a scooping bucket on her head in an attempt to understand and emulate the difficulties of the women slugging water weight day in and out. 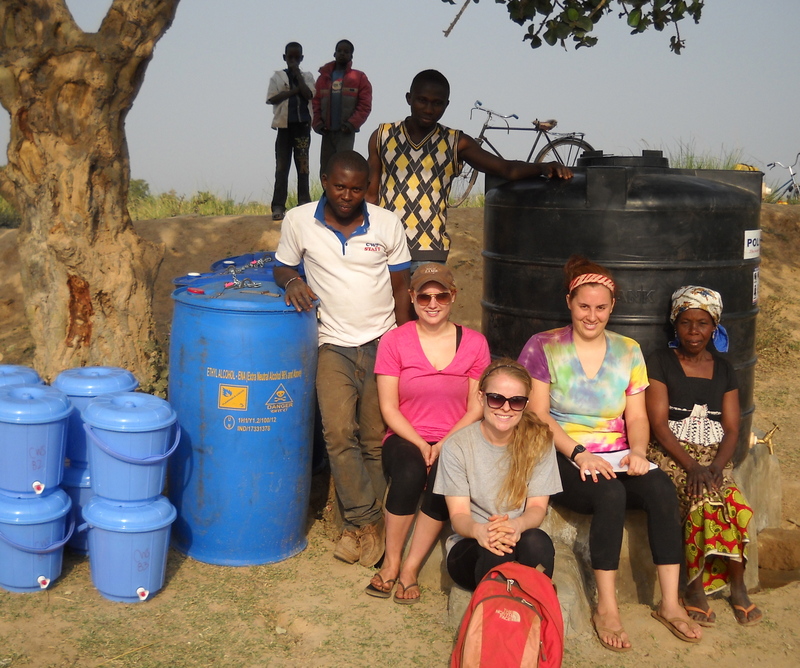 After finishing our water treatment duties, we commenced the community outreach portion. We returned to the village center and began to assembly the safe storage containers (picture on the left). Here you can see how passionate and ardent we were about assembling the containers correctly (Casey, T.J, and Ty were so intent on the task they didn’t even look up when I snapped a picture of them). 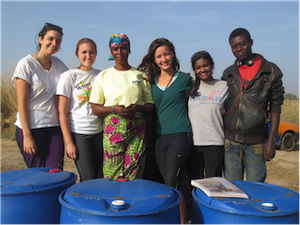 Afterwards the women assembled in clusters and we all gave them a pitch about harnessing the power of clean water and using it to improve their quality of life. The women assembled, participated in the process with gusto, and hit on all the key points. Some concerns that arose in this process were access to extra containers for larger families and the water treatment process. Here I glow with pride, as my team handled all the questions very very well. We were hot, tired, thirsty, but we had a sheen (and no this was not from the red dust but a glimmer of pride at what we had cultivated in this village: a relationship). We were so thrilled see such amazing community involvement! 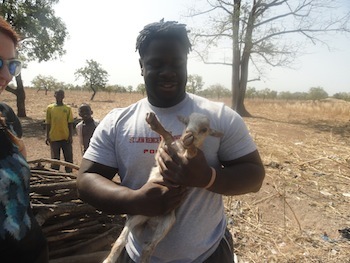 Our village’s was named Toyinahili, about 1 hour outside of Tamale. 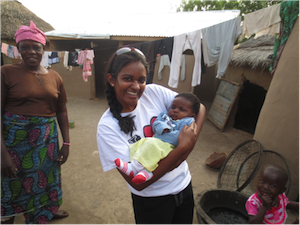 There are approximately 100 households in the village and many adorable children. Azabel (red shirt) hands the mason a tool to make the cement. The turnout to build the Polytank stand was predominantly male and everyone pitched in to help. It was nice to see the whole community come together to help the implementation process. Each person played an intrigal part of the stand: the son of the chief, Azabel and Shak (our translator) took control of the build and a mason came and did the cement work for free. Children goofed around and lounged the in shade – once spotting a crocodile in the lake and rushing over to see it. Our Polytank spot is wedged in between two trees by the dugout and is a beautiful spot for clean water. After the stand was finished we headed up to the center of the village and gathered the children around to brush their teeth. The day before, we had given each child a toothbrush and a toothpaste packet and taught them how to brush. 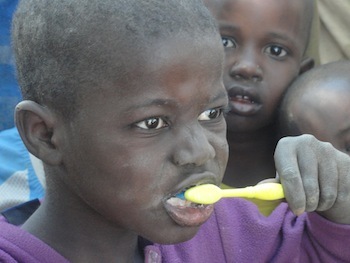 For all of the children, it was their first encounter with a toothbrush. Amanda noticed when she first arrived that all the children had very white teeth but as age increased, tooth decay did as well. Watching them raise their hands proudly to declare who had brushed the night before was an amazing feeling for everyone on the team. Today was also Iyi’s birthday 21st (January 6th)! Shak decided to pour water on Iyi to help him celebrate. A special celebration is planned for tonight! Our translator Shak can do just about anything as he is a “jack of all trades”. Whether it would be fixing his truck on the side of the road, or helping transport and build the parts of the water purification business, he always is calm collected, and nonchalant. This is because Shak has worked with CWS for a few years now, and he is always prepared for whatever the day brings. Our purification drums were held to the car solely by long strips of elastic, which was tied down securely by “do-it –all “ Shak. The cement work took about 2 hours however since a good portion of the community was there, many hands made light work. When the cement work was done everyone, Shak, Amanda, Caroline, and Iyi signed the cement so that the entire village would remember us for generations to come. Tomorrow we will begin training the appointed women to run the business on how to make the balls of alum and their role in the water purification business. Everything is running smoothly. Tohyinayili’s opening day could be easily as early as Wednesday, January 9th, 2013! 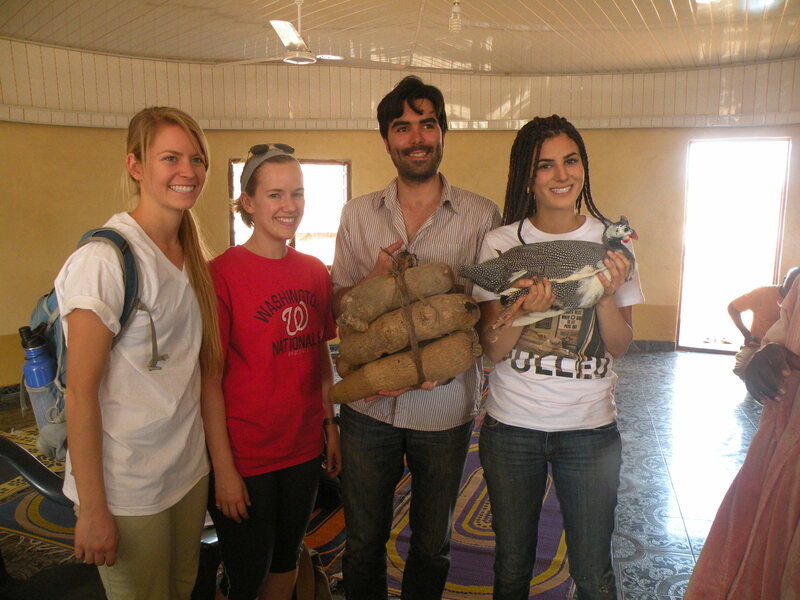 An hour and a half drive along the rough and dusty roads to the northwest of Tamale lies the village of Kasuliyili. With around 400 households (estimating about 3,500 people), and education-levels ranging from elementary to high school, some electricity, and a dugout the size of a lake, this village holds the title as the largest that Community Water Solutions has ever had the opportunity to work with. 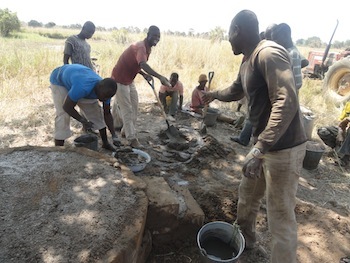 The grandness of the village made it somewhat difficult to believe that they did not already have access to clean drinking water, but the results of the test of the dugout water in Kasuliyili – rife with E. Coli and Coliform – were testament to the fact that we a had a tremendous challenge ahead. We rolled up our sleeves, layered on the bug spray and prepared for the weeks ahead! Today we had the honor of meeting with the village chief, who is an educator and nothing short of a visionary for his community. Our team met with “Chief Patience Moves Mountains” (awesome name, right? 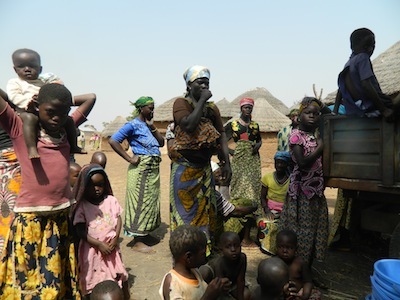 ), the village elders, the women leaders and other community members. Collectively, we discussed the different aspects of the CWS concept. We covered the importance of healthy drinking water, the building of the water treatment center, the training process with the women to run the business, educating the children in the community, and the ongoing monitoring of the business. After laying out the details and answering the questions from the elders and community members, it was now the chief’s time to speak. When he told us how important access to healthy water was for the village and accepted our offer to help, we couldn’t help but be heartened by his comments. When he gifted us yams and a Guinea Fowl, we were even more moved. We are incredibly excited to be a part of such an incredible project in Kasuliyili, helping to move forward Chief Patience Moves Mountain’s mission to bring good health to village over the next two weeks. 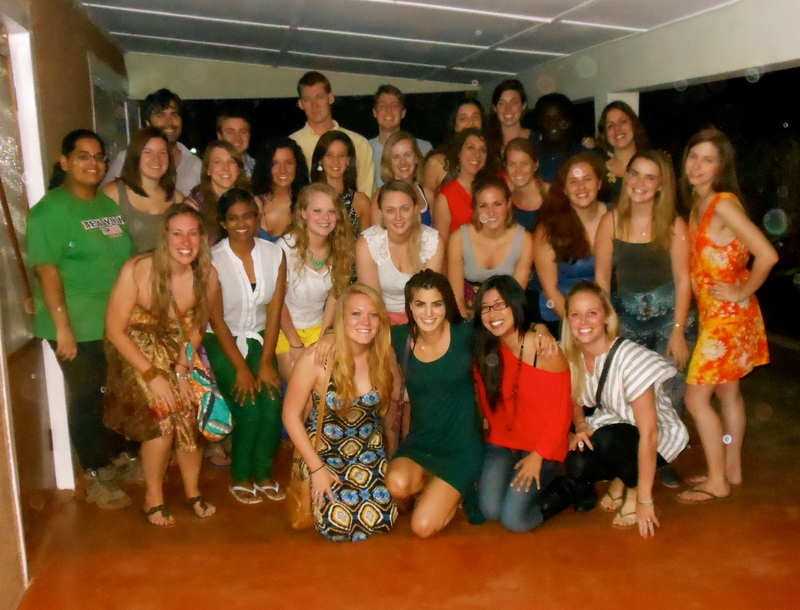 From our 2013 Winter Fellows!